nice and clean park..They need to trim trees around park sign or relocate. Every park we have stayed in had a listing of the tv stations avaiable this one did not. had to search thru channels to see what was on. Did not use restrooms. looked at them and seemed better looking than 5 years ago. They could relocate their sewer drains, a little hard to drain uphill. This park has numerous issues. It could be a great park, given the location and the grounds. However, it is not being cared for the way it should be. The restrooms and showers are old and not properly cared for. They are clean, mostly, but given their condition it is hard to make them really clean. The grounds have beautiful trees, pine and cottonwoods mostly, but there were many weeds and old leaves everywhere when we stayed there. We asked the staff to clean up our site and they did attempt to do that. However the sites need more attention in our opinion. The swimming pool was empty, given the time of year, but the office and other facilities are in need of upgrades or more repair. The dump station was not in good repair and it was locked, with no sign to let you know that you should get the key from the office. The wifi was fine, but the cable TV did not work with either my TV or our Friends TV in their RV. The office was not helpful about how to fix that problem, so no TV. Some of the staff were rude and not very helpful. I did point out some of the problems to the staff, but it was not well received. I do not think the park is worth the price they charge to stay there. I will find another park to stay in, if I return. What a refreshing place. 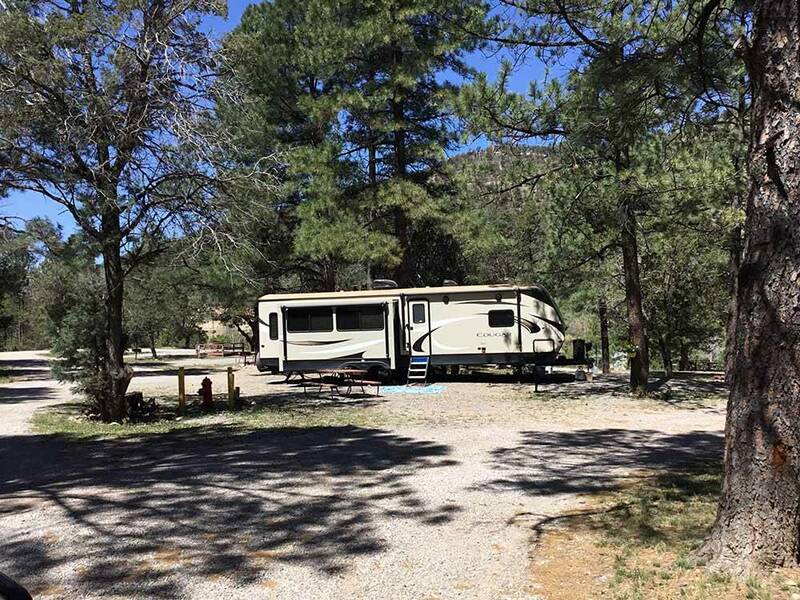 This campground is nestled into a hillside with towering pine and aspen trees. We stayed here after coming out of the desert. Don't expect resort-style luxury. Do expect a quaint, peaceful, and shaded hillside campsite that's close to shops and restaurants. Will definitely stay here again. A lot a personality. Many different levels big coaches stay on the bottom level close to restroom and laundry. Great water pressure good hot water, and clean laundry facilities. Upper decks are nice to walk thru. Lots of trees. We will stay there again. Nice helpful staff. We had a beautiful site looking down into the park with lots of trees and space. Deer grazing in the woods and a view of the mtns made it feel like you were in the wilderness and not on the edge of town. Staff is very friendly and helpful. We will be back here for sure! On a recent visit to Twin Spurce RV Park we found the campsite to be unacceptable. If you like camping in a parking lot with plenty of vehicle and pedestrian traffic, this is the place for you. If you have a dog, don't stay here! The dog "walk" is a 2 foot wide, heavily overgrown brush area on the edge of a deep culvert, no railing, beware. Make sure you know what you are reserving, because you pay up front and then see your campsite. No refunds, no oppourtunity to change or improve your accommodations and frankly rude staff! Needless to say, we didn't stay. There are plenty of beautiful campgrounds in Ruidoso, just not as well advertised. Make your reservations with care. Very friendly staff. Clean & well kept. This was our second stay at Twin Spruce and we highly recommend it. The park is attractive & the atmosphere is terrific.